How Directive is your child: Do they need to be in charge? How Expressive is your child: Do they need to be the center of attention? How Considerate is your child: Do they think about the needs of others? How Systematic is your child: Do they have a desire to follow the rules? Most young children have a cell phone or an iPad to stay in communication with their family these days. The NocNocK mobile app is designed to bring everyone together and allow everyone in the family to improve their communication with one another. We believe that one of the best ways to understand the power of this tool is to use it with your children. NocNocK provides an easy way to understand and communicate more effectively with your child. Our profiles help your child to better understand who they are, and they also help you to better understand your child. 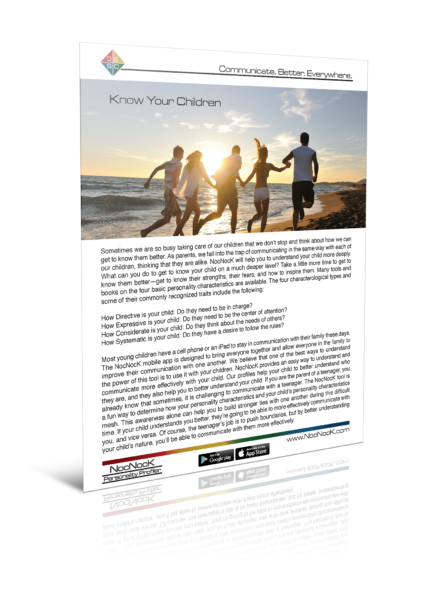 If you are the parent of a teenager, you already know that sometimes, it is challenging to communicate with a teenager. The NocNocK tool is a fun way to determine how your personality characteristics and your child’s personality characteristics mesh. This awareness alone can help you to build stronger ties with one another during this difficult time. If your child understands you better, they’re going to be able to more effectively communicate with you, and vice versa. Of course, the teenager’s job is to push boundaries, but by better understanding your child’s nature, you’ll be able to communicate with them more effectively.